Soil Secrets formulates Humus Soil Conditioners for the Home Owner and Farmer, as well as for the Engineering and Construction industries that deal with mine reclamation, erosion control, and vegetation management. Humus has amazing properties that make it able to build soils whether the starting material is Sand or Clay. Humus added to sandy soils can increase water and nutrient retention. Humus added to clay soils can help increase drainage by aggregating clay particles. Commercial Grade TerraPro® (Earth Magic®) is a unique concentrated humus product that contains a broad spectrum of beneficial soil microorganisms and soil enzymes along with a high percentage of Humic Acids (Humus). This product is used by Home Owners and Farmers to build productive soils. The objective of this product is to fortify the soil with the best humic acid product possible at the highest concentration possible. Agriculture Grade TerraPro® made for agriculture and other large industrial uses, the active ingredient of this product is the high concentration of Humic Acids that can function as a powerful biologic chemical of the soil, involved with hundreds if not thousands of bio-geo-chemical processes. Humic Acids are super molecules of soil that are essential for a healthy and productive soil and this product, formulated by Soil Secrets is guaranteed to have the highest biologic value of any humic acid product in the industry! This product can be used for agricultural and industrial applications, especially larger scale projects. The objective of this product is to make it economically feasible to fortify the soil with humic acids that work. Agriculture Grade TerraPro® is a Humus Based Soil Conditioner formulated by Soil Secrets. 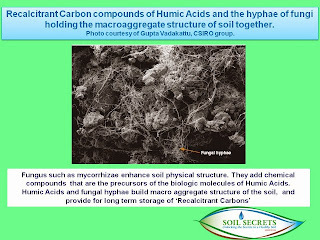 Humus is decay resistant recalcitrant carbon compounds of soil that help to give soil its life and structure. Humus can help soils retain water and nutrients and improves soil structure. Agriculture Grade TerraPro® is made for agriculture and other large industrial uses. The active ingredient of this product is the high concentration of (Humus) Humic Acids that can function as a powerful biologic chemical of the soil, involved with hundreds if not thousands of bio-geo-chemical processes. Click on the Link below to view our Agriculture Grade TerraPro® 0.6 ft3 bag label. The objective of Agriculture Grade TerraPro® is to make it economically feasible to fortify the soil with humic acids that work. 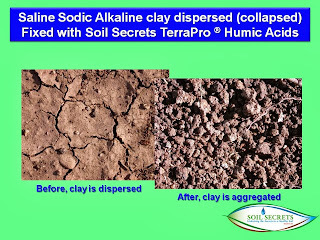 Please visit our website at: http://soilsecrets.com/ for more information about Agriculture Grade TerraPro® and Humus. Humates are often sold as a source of Humic Substances and Humic Acids. Humates are an ore, more properly called Oxidized Lignite. Lignite is coal, oxidized means it is not useful in a power plant. However, Humates are not able to associate with water. Soil Secrets with the technical assistance of the National Labs has performed the only molecular analysis and characterization study of Humic Acids, which has allowed us the ability to formulate a Humic Acid product that works, because it is capable of associating with water and functioning with Supramolecular capabilities. Where Can You Buy Soil Secrets Products? Do You Like Big Oak Trees? Biggest Oak Trees of the US! The Staff at Soil Secrets! Great news on some test results that just came in from Marana Arizona where a huge cotton grow-out experiment was conducted this year using Soil Secrets granular Ag Grade TerraPro Humic product. I'm going to share with you the part of the test that was conducted on parts of the farm that were having problems with sodium and salt accumulation and yield had been dropping off. 1. 70 acres of the farm that were impacted by high salt and soil dispersion were treated with 500 pounds of Ag Grade TerraPro. 2. Net profit for the 70 acres was $20,000 or $285.71 per acre. 3. The 70 acre plot that was always the lowest production area of the whole farm was able to out produce beat all three surrounding fields, producing one extra bale per acre. Another benefit, but not the only benefit of the mycorrhizal fungi No Till relationship is that of 'Humic Recalcitrant Carbon Molecule' production in the soil. That's the stuff that's black in color and which gives a top soil its characteristic darker color. It's also the stuff that by bad habit the entire industry generically calls humic acids. The term humic acid (or acids) does not describe specific molecular structures and the term does not follow the rules of chemistry nomenclature. However since our State Regulatory offices use this old fashion term and have very vague methods of measuring the stuff, we are stuck with using the term for now. 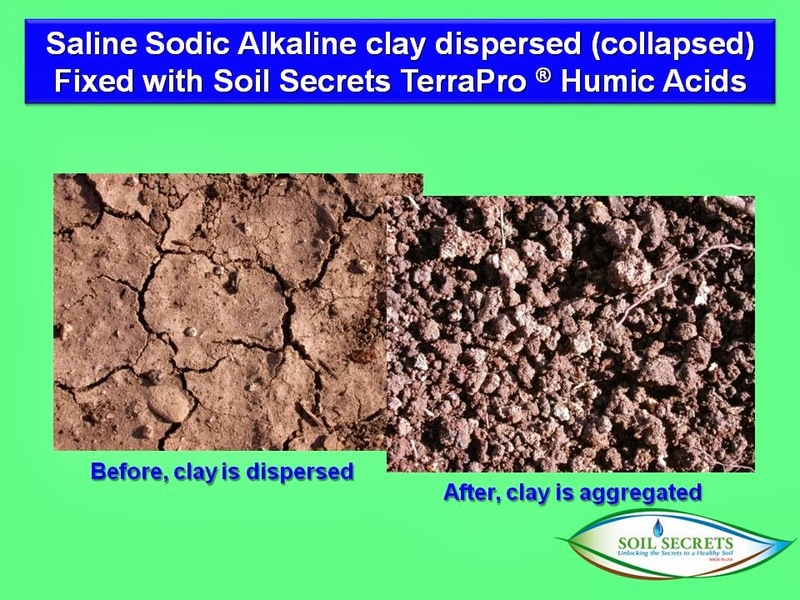 When Nature builds these amazing carbon molecules, or you supplement them by adding soil conditioners such as TerraPro by Soil Secrets, the molecules involved play a huge role in building macro-aggregate structure. This is caused by the polarity value of the molecules causing a 'mechanism of action' (MOA). See the image below which shows a collapsed, dispersed clay that has been reclaimed by using TerraPro, so it now has good macro aggregate structure. Being Recalcitrant, these carbon molecules have a long life expectancy in the soil as they do not decay back into CO 2 like compost, manure and mulches will do. So back to the question of Till or Not to Till? Where do the Humic Recalcitrant molecules come from in the soil? I'm convinced that they do not come directly from the decay of dead things, such as compost, manures and mulches. More specifically I believe they are coming from the precursor amino acids of the proteins found in the hyphae of the mycorrhizal fungal tissues. Another reason to inoculate with quality mycorrhizal products and Not to Till! The concept of no-till is to favor the proliferation of mycorrhizal fungal roots on the roots of the crop. The mycorrhizae produce a vast network of fungus roots called hyphae that are microscopic, however they are of critical importance in holding the soil structure together in what we call macro-aggregate structure. They are also responsible for many other benefits to the host plant, but for now let’s stick to the soil structure benefit. The slide below shows this soil fungal hyphae relationship. When we plow or till soil we clobber this relationship, making it difficult for mycorrhizal fungi to perpetuate in an agricultural setting for very long, resulting in most agriculture crops not being mycorrhizal. This includes organic farms as well! Beyond the physical characteristic of the fungal hyphae gluing the soil macro-aggregate structure together, the hyphae also contain huge amounts of Nitrogen, which potentially is the single largest contributor of that element to the Soil Food Web. How do we know this, because research has measured the fungal tissues at 10% Nitrogen, a big number when compared to the many approved organic fertilizers on the market. For example, liquid fish is only 2% Nitrogen, a very expensive way to get Nitrogen into the system. Protein Crumblies, a product of Soil Secrets is 8% Nitrogen and a much more affordable way of getting organic nitrogen into the system, when supplemental nitrogen is needed! So if you inoculate your crop seed every year with a mycorrhizal product like Soil Secrets “White Lightning” you will most likely have an abundance of mycorrhizal tissues always cycling in the soil contributing Nitrogen while they are also gluing the soil together. What a Great Idea!